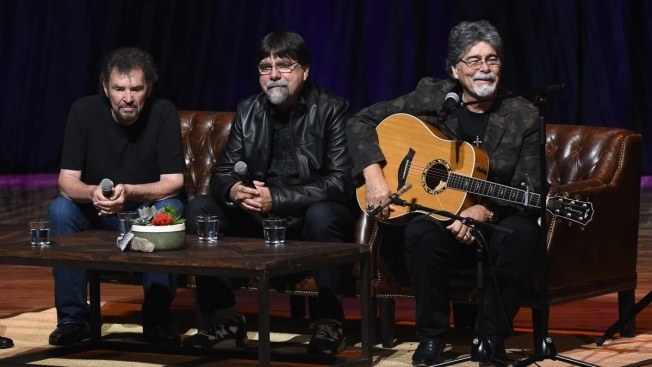 This Nov. 5, 2016, file photo, shows (L-R) Alabama's Jeff Cook, Teddy Gentry and Randy Owen perform during The Country Music Hall of Fame and Museum Presents an Interview with Alabama at The Country Music Hall of Fame and Museum in The CMA Theater in Nashville, Tennessee. Country music band Alabama will be hosting a benefit concert in Alabama for Jacksonville tornado relief. A statement by Jacksonville State University says Alabama has pledged to give the proceeds after expenses to the school for tornado relief. A storm hit the campus and city in March. Citing the statement, AL.com reports Alabama has added several bands to the line-up including the Charlie Daniels Band, Jamey Johnson and Riley Green. The statement says this concert is the only time Alabama will be performing in the state this year. Alabama lead singer Randy Owen says the storm did a "tremendous amount of damage" to his alma mater and the band wants to do its part to help. Tickets go on sale Tuesday and start at $25.